Guidelines for editors, navigating Scholastica and FAQs. These guidelines are continuously evolving according to feedback from our editors, referees and authors, as well as the sporadic Scholastica update. If you have a general question, comment or suggestion that may be of interest to more editors, start a discussion there. If it’s a question regarding a specific manuscript, start a discussion on the manuscript’s page. Make sure that the admins are CCed in these discussions (tick the boxes with Admin and Lukas’s names). Lukas Schalleck, our editorial assistant, who works for Quantum. Lukas goes through the system 1-2 times a week, and keeps things rolling overall, by responding to technical questions by editors, referees and authors, sending reminders when something is delayed, going through all the tasks below marked as [admin], and notifying the executive board in unclear or urgent cases. Christian Gogolin, Marcus Huber and Lídia del Rio from the executive board. We intervene occasionally: when Lukas notifies us, when editors have general questions or comments about Quantum, when Lukas is absent, when something needs urgent action, when a new editor is being trained, and when we wake up at 6am wondering how the journal is doing. Lídia is using the Admin account, while Christian and Marcus have personal editor accounts due to COIs with submissions. It’s ok to take breaks! The wellbeing of our editors comes first. If you go through a busy or difficult period at any point (examples: writing a grant, reviewing for a conference, holidays, family duties, burnout, too much on your plate, mental health hardships, just need a break), you can just let the admins know that you won’t be able to handle submissions for X weeks/months, and we will take care of it, no questions asked. You don’t have to tell us why. Towards the end of that period, we’ll get in touch to check if you are ready to return to action. You can let us know by email or any other form of communication (including via third parties). On the editorial side, we will take measures to ensure that their manuscripts under review don’t get stalled; these measures may include transferring the manuscripts to other editors. We will also mark this editor as “currently absent” so that the coordinating editors won’t assign them new manuscripts. Internally, in the executive board, we will assume that the editor is not doing ok, that they are going through a difficult time. The reasoning is: if this was a planned break, or the editor was simply very busy, they’d be able to notify us. Empirically, this is what happened most of the time. We will try to reach out to the editor and see if they would like support. We won’t insist, if the editor chooses not to be contacted. Note: If you are not doing ok, know that you can always reach out to a member of the executive board. We will never judge, and any information shared is confidential. We can help. We may not be able to pay our editors, but at least we can look after each other. Quantum is a selective journal, publishing both original research and review articles, theoretical and experimental. Works should make a significant conceptual or technical contribution, as judged by experts in the subject. Quantum encourages submissions that provide an honest assessment of their scope and limitations. Correct research that incrementally improves a limited technique is below threshold. For original research, either a very significant technical or conceptual contribution or a nice combination of both is necessary for acceptance in Quantum. Sound motivation of the work. Guiding question: would I recommend this paper to a student or colleague who is working/interested in the topic? Wide scope / aiming at an interdisciplinary audience. In general, if a paper is of great interest to a small number of experts, this is in scope. Format constraints. That being said, the paper should be well written. 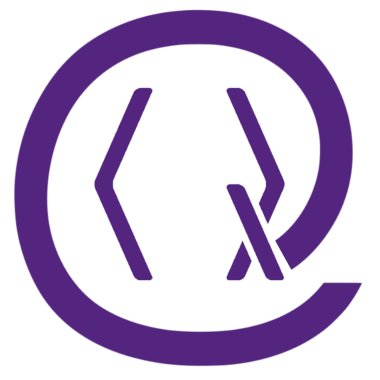 In response to editors’ queries, we will keep updating this list with kinds of (non-obvious) papers that are in scope for publication in Quantum. See also the full list of papers published in Quantum. A clever solution to a difficult, reasonably well known, and long-open technical question of narrow scope. Broad interest is appreciated, but not a necessary criterion for acceptance as per our editorial policies. In case of doubt, always check with other editors before making a decision. New submissions are assigned randomly to one of the coordinating editors. The coordinating editor should then assign it to a suitable editor within a few days. If you are assigned a paper and think that you cannot handle it (too busy, lack of expertise, conflict of interest), please reassign it back to the coordinator immediately, and write them a note on the “discussions” tab to let them know. You can also suggest alternative editors from the board. If there is a clear-cut reason for rejection (the paper is not on the arXiv, is clear nonsense, or is completely off-topic, e.g. about floriculture), go ahead. Use one of the decision templates provided. If there is a scientific reason (you think that the paper is wrong, incremental, poorly written, slightly off-topic, e.g. about classical computing, or will not meet the acceptance criteria after reviews), then start an editorial discussion with the other editors who are experts in the topic, and make sure to include at least one coordinator editor. In it, justify your decision. If a consensus is reached among editors, go ahead and reject. 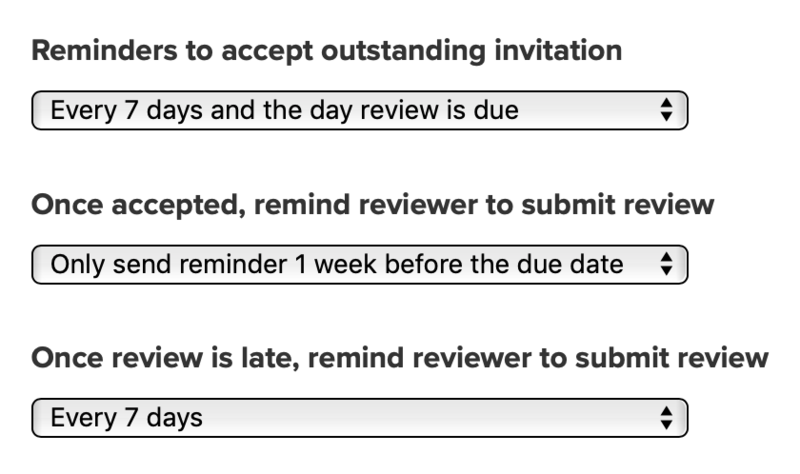 If you want to send the paper out for review, invite referees within two weeks of being assigned the paper. In most cases, two reviews are necessary for the decision, so try to invite 2-3 referees in the first instance, and keep an eye on their responses. Admins will help you with this. There is a template to invite referees. It is not unusual that 6 or more invitations are needed to actually obtain two conclusive reports. Admins: If it has been more than three weeks since a submission is in the system and no referees were invited or decision were made, start an author discussion, including the current editor and coordinator, to update the authors on the status. Suggested referees. Editors should use their judgement on a case-by-case basis. These lists can be quite useful, and if the editor believes that some of the referees suggested by the authors could give a good, unbiased review, do invite them. As a rule of thumb, try to also include one referee who was not suggested by the authors. Referees to avoid. By default respect the request. If the editor cannot find reliable referees outside the blacklist, or has reason to believe that all competent referees have been included on the blacklist, then they may, at their discretion, invite one of those referees. If a paper is rejected as a result, and the authors appeal, then any bias of the referees should be investigated by coordinating editors. As a policy we do not ask authors why they chose to blacklist a referee, as this may be personal, confidential information. Conflicts of interests. Editors and referees should declare whether there exists a potential conflict of interest regarding a particular submission, and, if appropriate, exclude themselves from handling that submission. Reasons for conflict of interests include: close collaboration with the author(s), personal relations with the authors, concurrent competitive research, same institution, and financial co-dependence. As a guideline, editors should not have joint papers with the submitting authors in the previous four years, and referees should not have joint papers with the submitting authors in the previous two years, if possible. Like most editorial guidelines here, this is just a rule of thumb, and we expect editors to use their judgement on a case-by-case basis, and to consult with each other and admins when in doubt. Often a referee will say something like “I’d be happy to review the paper, but I’m not sure if X constitutes a conflict of interest.” Editors can ask follow-up questions and make their own call. You can judge whether you trust the referee to be unbiased in circumstances X, and if you end up accepting them, you can weight their report according to this information. In addition, editors can send personalised reminders any time via ‘referee discussions’ through Scholastica, to check in with the referees. invite a new referee if there is no response within a few days. If a paper has been out for review for months and it has been particularly difficult to find referees to review it, then the editor should have an in-depth read of the paper themselves, and/or start a discussion with other editors in the field. Leave all star ratings as neutral. If the report is a txt or doc, post it whole in the first box, if it’s a pdf add it as an attachment at the end. Fill in the remaining boxes with “[see above]”. This should be primarily the job of the admin staff, as to not overburden editors. However, editors can also do it if for whatever reason they wish to. Superficial reports. One of the questions asked in the report form is “to what extent did you check the technical correctness of the paper?” If all the reports received recommend acceptance and at the same time have not checked the proofs, this this a problem. As an editor, you are then encouraged to write back to the referees with something along the lines of “All referees are very positive about this paper, but none seems to have checked the correctness of the results. Would you be able to go through the proofs?” On the other hand, if the reason why the referees have not gone through the proofs in detail is because they are unreadable, it is more than fair to ask the authors to write a clearer version of the proofs for the next revision. As a rule of thumb, papers published in Quantum should be pedagogically written, and technical details should have been checked by referees. First decision. Once the reviews are in, consider them carefully, and try to make a decision. In unclear cases (and this happens frequently), you are encouraged to discuss the decision with other editors in the field, as well as the coordinator editors, who have a good overview of the selection criteria. You can also communicate with the referees to clarify inconsistencies. We expect editors to use their own judgement as experts in the field, rather than just taking reports at face value. If it is clear that the paper won’t meet Quantum’s acceptance criteria even after revision, we prefer to reject it after the first round of submissions, to spare authors’ time. You are welcome to suggest appropriate alternative publication venues to the authors. 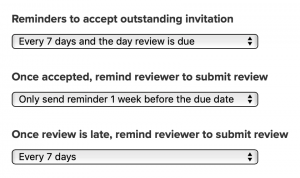 We have a few “revise and resubmit” decision templates which communicate whether the paper is likely to get accepted or rejected after the next round of review. Scholastica is a great platform for handling peer review – and its resubmission interface is its Achilles’ heel. We have notified Scholastica about the following issues and they are working on it. In the meantime, we have a few workarounds of mixed elegance. 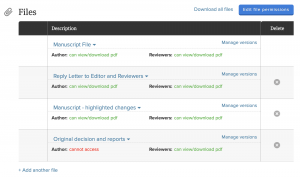 Are the referee reports from the first round of submissions visible to reviewers? This is not provided by Scholastica at the moment. The admins will manually send the decision and anonymised reports to the referees at the moment of the original decision, but these may not be fresh on the referee’s minds by the time of the resubmission. Go to v1 of the manuscript >> Read decision >> Print decision. Save as pdf. Go to v2 of the manuscript >> Add another file >> Add the pdf of step 1. Top right of the file list: blue button “Edit file permissions” >> Make the decision file available to reviewers. The decision pdf includes the initial referee reports (except for confidential comments for the editor), so it should be all that you need. This pdf will also be visible to new referees that you invite to review v2. Warning: please make sure that you print and share the decision, and not the original reviews directly, as they contain confidential information (like the reviewers’ names and comments to the editor). Are response letters visible to reviewers? By default, if the authors upload further files such as a response to the first round of reviews, these are not visible to referees. It is the editor’s task to read the files and decide if they are suitable for sharing with reviewers (e.g. there’s no confidential information intended only for the editor). In most cases you will want to share the letter with referees: do so by changing the file permissions, as shown above. Must referees fill in all the questions in the referee form again? Yes and no. This is annoying, but at the moment Scholastica does not have a feature for an updated referee report form for the second round of revision, nor to make the answers voluntary. At the moment, our solution is to tell referees that they can simply fill in most spaces with “see above”, ” – “, etc. Alternatively, the referees may send a free-form review, and then it’s up to the editor to fit it into the form, as above. These instructions are already written on the template for the invitation letter to review the revised manuscript. Appeals are submitted by authors via the Quantum website’s appeal form (not through Scholastica). The appeal is received by the admins as an email. The protocol for processing appeals is currently the following. All times are suggestions rather than strict deadlines, and are counting from the receipt of the appeal. By t=2 days: Appeal is received by the admins. Admins upload appeal to the manuscript file on Scholastica and start a discussion with the original editor and all coordinating editors to inform them. 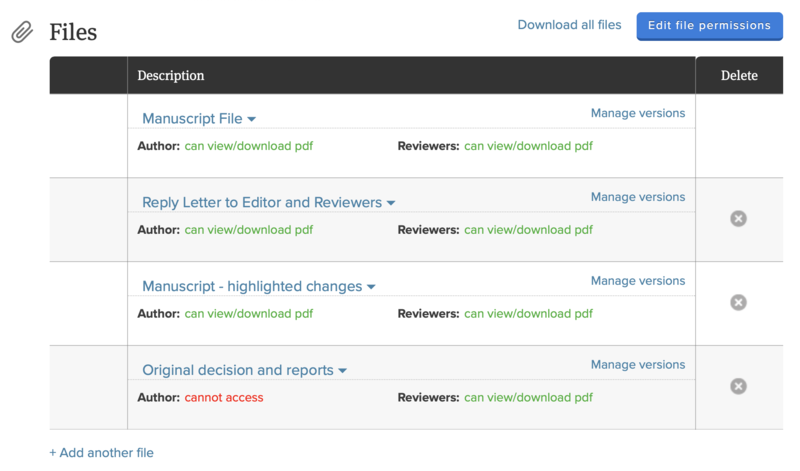 Admins should also upload the appeal message as a file on the manuscript’s page on Scholastica, with the permissions such that it’s visible to authors but not to reviewers. g) when the authors may expect new updates (this may depend e.g. on referee deadlines). The goal of this update is to be as transparent as possible while still protecting the privacy of referees and editors involved. Our editors are doing a great job discussing decisions behind the scenes, and it is important that this is communicated appropriately to the authors, as to not give the impression that the editorial decisions are arbitrary. This section goes for admins (currently Lukas). Notify the authors of the status of their manuscript once a month after the submission. There is a template for this. In particular, let them know who the assigned editor was, and when we expect the reviews to be in. Once a decision is made on a paper (rejections, ‘revise and resubmit’ or acceptance), print the decision (as shown above) and attach it to a thank you message for the referees who submitted reports. There is a template for this.